Considering Facebook only fully rolled out free mobile VOIP calling to Messenger last April, it’s impressive that it’s already becoming a legitimate competitor to apps like Skype. And just yesterday it began rolling out free VOIP calls to WhatsApp on iOS after bringing the feature to Android last month. Zuckerberg reiterated that Messenger and WhatsApp will not be integrated. Still, he says “one our theories is that you need a large established network of people who will be able to receive the calls” for VOIP calling to become popular. With 600 million Messenger users and 800 million WhatsApp users, he thinks they’re both finally hitting that critical mass. 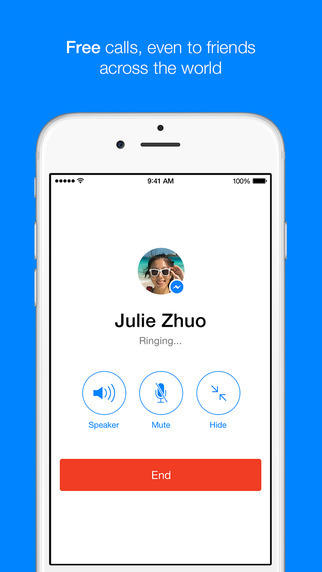 And just today, Facebook released its caller ID app Hello that lets you easily ignore normal phone calls and then Messenger VOIP the person right back for free, which could further boost usage of the feature. Meanwhile, Messenger is still exploding as a text message alternative. Its 600 million monthly users now send an average of 45 billion messages per day. At this rate, messaging is beginning to look like a Facebook-dominated game outside of China. With Messenger popular in the US and WhatsApp winning in Europe and the developing world, it’s only China where Facebook can’t operate that another service, WeChat, is on top in a major market. It’s a unique strategy that gives Facebook a huge advantage on mobile where cramming ads and payment channels everywhere can feel obtrusive. Instead, Facebook can keep most of its apps and experiences clean and free since it makes so much money on ads in its main app — $3.32 billion in Q1 2015 alone.